Solar power is an excellent renewable energy. The sun produces sunlight and solar panels convert that into energy. Solar power can reduce your carbon footprint in the world and in some cases, eliminate your energy bill. Giving an Eco-friendly gift is a nice way to help save the environment. There are many devices that are now solar powered. Solar power is becoming more efficient and the technology is getting better. 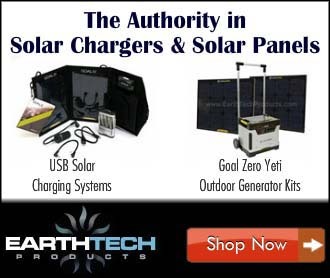 Let’s take a look at some great solar powered gift ideas. A portable solar panel can make a nice gift for someone who is a backpacker or hiker. They are lightweight and fold up slim. They can also be hooked to the back of a pack and charge devices as you are hiking. Portable solar panels come in different sizes and allow you to charge a smartphone and electronic devices. Make a solar-powered charging station for your phones and tablets by placing a portable solar panel by a sunny window. You can also combine a portable solar panel and charge a power bank battery. The battery in the power bank can then be used to charge your devices. With a panel, you will always have stored power to charge devices. See our list of the best portable solar charging panels here. Power banks are small devices that contain a battery and can charge a phone, tablet or recording device. Many have an attached solar panel to charge them. These solar powered banks are convenient for those who are outdoors and not near a power outlet. They will not charge as quickly as using a portable solar panel, but they do take up less space and are quite convenient. They can store solar energy and give your devices several full charges before they need to be recharged. Everyone likes to listen to some good music. A blue tooth solar-powered speaker is a great way to take your music with you. These speakers have a solar panel and will charge themselves using the suns rays. They store the energy in a lithium battery. A solar-powered speaker can play for many hours before needing a recharge. Just connect a phone or tablet to it and you can listen to great quality sound. Check out our list of speakers to consider here. Solar powered backpacks are favorable for anyone who needs to keep their devices charging when they are on the go. A solar panel is built right into the back of the backpack. Just place your devices into your pack and start charging. These solar packs are great for students or hikers. If you know someone looking to make the jump to solar for their home or RV, then a solar panel starter kit can be just the gift they need. Solar panel starter kits can get someone started on living the solar life. Many of these kits are inexpensive and can be expanded as your capacity needs change. Books on building and installing your own solar array can be helpful and give you step by step guidance. These books can take you through the whole process. They are an excellent resource to get someone to live off the grid or supplement their energy using solar. See our article on some recommended solar panel books. A solar-powered generator works similar to a gas powered generator but uses solar power to charge a battery to power up appliances, lights and household devices. They are self-contained units that come with solar panels and a generator box. They have outlets for USB, 12 volt and 24 volts. Solar powered generators are great for emergency situations like loss of power from a storm or remote areas where power is limited. One major advantage is solar powered generators can be used inside a home, unlike gas-powered generators that emit dangerous CO2 gases that can kill. All of these solar options can make a great gift. Going solar can help reduce our consumption of fossil fuels and emission of greenhouse gases. Even using a small solar powered device is a step in reducing our carbon footprint.